Please have your exact fare when boarding the bus. No change or fare credits are given. Offers a 10% discount per ride. 31-Day Pass valid for 31 consecutive days from the first day of use. *Seniors 65 years of age and over; Medicare or ADA cardholder. **Children under 5 ride free with a paying customer. ***Zone 2 31-Day Pass also accepted on Zone 1 buses. All Coastal Express trips pay Zone 2 fares. Please have your exact fare when boarding the bus. No change or fare credits are given. All Coastal Express trips pay Zone 2 fares. Offers a 10% discount per ride. **Children under 5 ride free with a paying customer.Zone 1 - In Ventura County. Zone 2 - Out of Ventura County. 31-Day Pass valid for 31 consecutive days from the first day of use. Zone 2 31-Day Pass also accepted on Zone 1 buses. You may order your VCTC Intercity bus pass online or by phone using MasterCard, VISA, or Discover Card. Passes are also available at any of the locations listed below. Depending on the location, passes may be purchased with cash, check, or credit card. Not all types of payment are accepted at every location. Please call the retailer to check the availability of the pass you want to purchase and the payment type accepted. To purchase by phone, call VCTC  at 800.438.1112. Phone orders can be placed using a MasterCard, VISA or Discover. As part of continued efforts towards a regional bus pass solution, we are expanding usage of our VCTC 31-Day (Zone 1/Zone 2) Bus Pass to participating agencies. Your VCTC 31-Day Pass is now accepted as payment on-board the following listed bus systems. Keep checking back as more systems are added. The College Ride Pilot Program will allow students enrolled at California Lutheran University, California State University Channel Islands, Moorpark College, Oxnard College or Ventura College to ride any public transit bus in Ventura County for free. Students will need to show their school ID to the driver in order to board for free. The pilot program will last the duration of the 2018-19 academic year. 2. Exit the bus at your transfer point and wait for your second bus. Transfer is valid for 90 minutes from the time it is issued. 3. 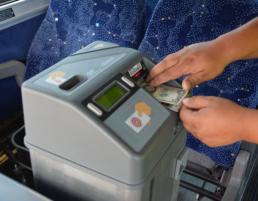 When your second bus arrives, insert your transfer into the farebox along with any applicable fees. Transfers may not be used for stopovers and cannot be used for a return trip. You must transfer at the first point of contact with the route you want to transfer to. Transfers must be kept in a clean, presentable condition. You may not sell, trade, exchange, give away, or offer for passage a transfer in violation of the rules of VCTC. In case of dispute, you are required to pay the full fare and notify the Regional Transit Information Center at 800.438.1112 or send us a message. VCTC is not responsible for lost, stolen or damaged passes. Passes are not transferable or refundable. Pass not valid if mutilated. Treat passes like cash.